Abstract - An abstract is a summary of the history of ownership of the property. If an existing abstract needs to be updated or continued, the cost will be lower than if a complete, new abstract must be prepared. The cost for an abstract is usually paid by the Seller. Down Payment - Most lenders require a borrower to pay at least 3% of the purchase price as a down payment but certain loans or government loan programs require less or even no down payment. Loan Origination Fee - A loan origination fee is a lender's fee to a borrower for establishing a new loan. Conventional loan origination fees often range from 1 to 3+ points. A point is 1% of the loan. Appraisal Fee - An appraisal fee is paid to an appraiser to obtain an estimate of market value upon which the lender will base the loan amount. The cost is about $350-$400. This fee is usually paid by the buyer. Credit Report - A credit report is an evaluation of the buyer's credit habits made by a credit bureau for the lender. The cost is $50-$60 and is usually paid by the buyer. Inspection Fees - Inspections the buyer may choose to have done may include a general property inspection that usually cover foundation, electrical, plumbing and overall construction at a cost of $300 -$400. Roof inspections cost $75-$125. Septic inspections may cost between $200-$400. Document Prep Fee - This is like a bill of sale for real estate. This cost ($50) is usually paid by the buyer and the seller. Plat Sketch - A plat sketch is a sketch of the boundaries of a piece of real estate used to determine whether buildings or other improvements are actually located on the property and that the neighbors' buildings or improvements do not encroach on the property to be financed. Miscellaneous Costs & Fees - An estimate of $300 should be considered to cover other items such as recording fees and document preparation, as well as allowing for variations from these other estimates. 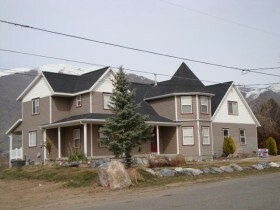 Beware of extra costs when Buying a Home in Utah County. Hazard Insurance Reserve - If hazard insurance is to be paid monthly to the lender, a portion of the next premium is collected for the escrow account in order to ensure that enough money is impounded to pay the premium when it comes due. The buyer will usually need to either provide or pay for coverage for the 1st year. Recording Fees - Charges by the County Recorder to record deeds, mortgages, satisfactions of mortgage or other documents required to clear or transfer title are collected by the closing agent. In Utah County the cost is $20.00 for each document and each party may be required to record one or more documents, depending on the transaction. Prepaid Interest - A borrower often must pay interest from the date of closing to 30 days prior to the first regular mortgage payment. Mortgage Insurance - Mortgage Insurance usually is required on conventional loans greater than 80% of appraised value. The cost may range from 1/2% to 1% per year and 14 months premium is often collected in advance. This is coverage for the lender in case of default. The premium is paid by the buyer. Tax escrow (impound) - If the new loan is going to have an escrow account for the payment of taxes and insurance, the lender will require from 2-10 months taxes to be deposited at the time of closing, depending on when the next taxes or insurance need to be paid out of the escrow account. These sums are paid by the buyer/borrower. Closing Fee - Closing fees are paid to the closing agent for closing the transaction. These fees range from $100 - $140, depending on the complexity of the closing. Usually the buyer pays a fee to close a loan if there is financing and a seller pays a fee for the work needed to transfer ownership of the land to the buyer. Each party may hire their own closing agent, though, to ensure that their part of the transaction is properly handled. Or the parties may choose to hire the same closing agent to close both the seller's and the buyer's portion of the transaction.